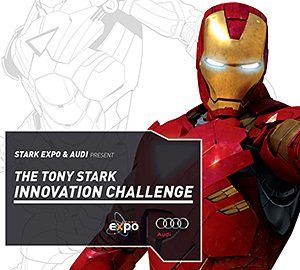 You get the feeling that innovation contests have hit the mainstream when one is sponsored by Tony (Iron Man) Stark, but these contests are making real-life superheroes out of young entrepreneurs around the world. Tony Stark, the entrepreneur-turned-superhero from the Iron Man movies and comics may be fictional, but the Tony Stark Innovation Challenge, an award for young entrepreneurs, is quite real. Earlier this month, MIT graduate student Nathan Linder flew off with the $15,000 top prize for his invention of a digital bulb to project Web content onto any surface. The prize was furnished by Audi of America. The Stark Challenge is only the latest (and most opportunistic) of a booming trend in innovation and entrepreneurship competitions that is helping to bring new ideas to the attention of investors, customers and a public hungry for some good economic news. In the U.S., where entrepreneurial culture and infrastructure are already well-developed, this is an incremental increase in opportunities for the mad scientists and dreamers among us. But in the rest of the world, it’s a revolution that’s kicking up a new wave of business creation with the potential to uplift billions. Last month in Lima, Peru, The Innovation Contest of the Americas (TIC Americas, sponsored by the non-profit Young Americas Business Trust in collaboration with the Organization of American States) recognized more than a dozen young entrepreneurs from Central and South America, culled from over 3,200 submissions. Full disclosure: I was a judge in this contest and saw with my own eyes the depth, sophistication, ambition, and ingenuity that is fermenting throughout the hemisphere, from Mexico to Argentina, Chile to Jamaica. Typically, the contests showcase the best new ideas in social entrepreneurship and eco-innovation alongside commercial and technology-oriented projects. Sometimes the lines are not so easy to draw. DUTO, SA, the winner of the 2007 TIC Americas award as well as a host of others, invented a sensory-based display that allows visually-impaired people to perceive information on a computer monitor. Their socially-oriented goal is to make the product affordable and accessible to primary schools in Latin America, but DUTO is a commercial business. Winning an innovation contest brings financial resources and recognition, which are both valuable commodities to startup businesses, but in emerging markets, they serve an even more important function. They validate the risks and efforts of innovators: the long hours and sacrifices that dreamers have made, rather than settling for the traditional paths of advancement or stagnation. Never mind Tony Stark and Iron Man: the winners of these contests are real-life heroes in their hometowns and role-models for young people hungry for change and new opportunities. Very often, successful entrepreneurs in these regions invest considerable amounts of their time and resources to build, strengthen, and advocate for a local entrepreneurial ecosystem, including better infrastructure, greater attention from the financial sector, and more pro-entrepreneurial policies from the government.